All international students inside the United States must file their tax return each year. In 2019 this needs to be done on or before April 15th. 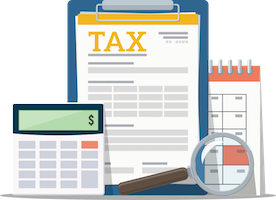 Our tax section has all the information and advice you need to file your tax return and get professional help, if needed. Every international student, along with their dependents, will need to file Form 8843 separately. If you have received income in the last calendar year then you will need to file Form 8843 and most likely Form 1040NR-EZ also. How do I submit these forms? Do it yourself - the forms are all available online from the IRS and you can print them off, complete them for each family member and submit them to the IRS directly for processing. Do it yourself (with our help) - we have created an online IRS Form 8843 Wizard that pre-populates the Form 8843 automatically for you. Enter all your details into the web form for us to pre-populate Form 8843 with all your details. Check it over, sign and date it and send it to the IRS for processing. Expert Tax Advice - we have partnered with Sprintax to provide expert tax advice and assistance for a fee. You can contact them directly for any expert assistance or advice you need which is especially helpful for more complicated tax returns. You might get a refund - Some international students will qualify for a refund due to tax treaties and a lack of serious income if they’ve earned income in the US. You fulfill your visa obligations - All international students must file at least Form 8843 (see below) in order to remain legal under F, J, M & Q visas, even if you didn’t earn any money in the US. Americans and others residing within this country must pay taxes to the state and federal government, and the process is completed through an agency called the Internal Revenue Service (IRS). Usually when someone earns money a portion of it is automatically deducted and sent directly to the government. Organizations that pay individuals send a summary of how much money they paid you every January or so, as well as how much of that was sent to the government. The purpose of filing your tax return is to report all your sources of income to the government, what you already paid, and what you still owe. It is also an opportunity to claim deductions or exemptions you may qualify for. At the end of the process, you calculate how much in total you should have paid. If you paid more than what you owe during the year, you get a refund. On the other hand, if you didn't pay enough, you have to pay the difference. Have more questions about your taxes? If you have any additional tax related questions, your best option is to call the IRS directly at free phone 1-800-829-1040. They will be able to provide the best guidance and advice for any tax related questions you may have. We have also partnered with Sprintax to provide you with expert tax advice, please contact them for further assistance.